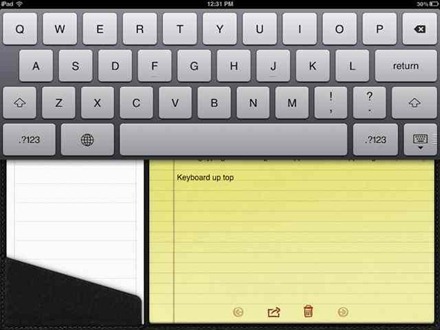 With the iOS 5 update, apple has decided to improve upon an area of their iPad most wouldn’t give a second thought to: its keyboard. The new iPad keyboard offers a lot of flexibility in its layout to make it more accessible in the myriad of situations you need it in. While the default keyboard format works fine while on a flat surface or a stand, what do you do when you’re holding it in your hands; such as typing on the go? Even in portrait mode, unless you have hands like a basketball player, your thumbs probably can’t reach all the way across the keyboard without a bit of uncomfortable shifting. Luckily, the new “Split” function has a solution. 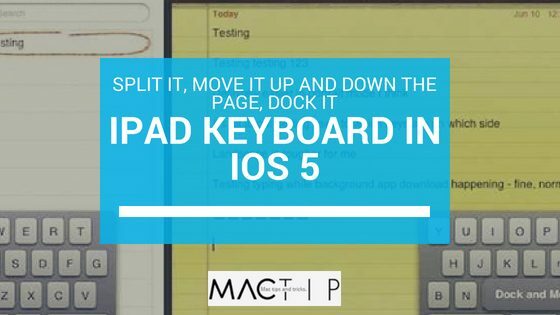 “Split” does exactly what it sounds like: it cuts the keyboard in half and moves the pieces to either side of the screen. Now your thumbs have access to the entire typing range without any needless contortion. To use this feature, all you have to do is swipe two fingers away from each other over the keyboard. Alternatively, you can simply tap and hold the keyboard icon on the bottom right and select “Split” from the pop-up menu. Reversing this is just as simple: either grab both sides and swipe them back together, or hold down the icon and select “Dock and Merge” from the menu. To use this feature, hold down the keyboard icon in the bottom right corner and select “Undock.” Now you can slide the keyboard up and down the screen til your heart’s content. It works the same whether it’s split or merged too. Moving it all the way down to the bottom again will return it to default, or you can hold down the icon and select “Dock,” or “Dock and Merge” if it’s split. Though there are a few trade-offs to using these features, such as the keys being smaller when they’re split, with a bit of practice I’m sure we’ll be glad to have them. After all, it’s always nice to have more options.